We have been trying to make our art come to life! 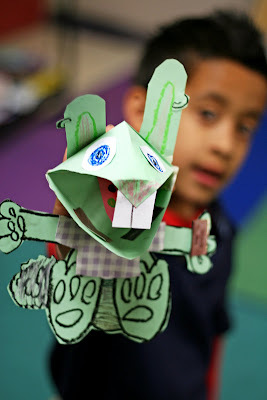 We made bunny puppets this week and each bunny had to have a name, and a personality. We had mini puppet shows at the end of class that went over very well. The kids had so much fun bringing their art to life! I even had a teacher tell me that they took their bunnies to recess and wanted to use bunnies to do math and science too! And second through fifth made 3D puppets!! They turned out very individual and adorable. I wish I had my camera yesterday because the fourth graders had huge sunglasses, and all kinds of trendy wears on their bunnies!! The bunnies puppets are really cute. Thank you for sharing. Like you ideas n now following for some new one. please visit to see my art. i love the way you give visual directions for your lessons. I love this and want to do it with my students but I'm having some trouble with the whole folding of the head. Mine isn't coming out looking close to your students. I feel like such a blonde trying to do this when you have 3rd graders that can do it! lol How does it need to fold together. I don't get the whole cutting one side then what? Thanks!! ok after you fold in an "X" you just cut one side of the "X" and then after you make that cut, it looks like a square with 2 "legs" you "cross the legs" or overlap those two side where you cut it and tape or glue them together so it looks like a pyramid. You do this same process with the other square and then tape the two pyramids together to make the head/mouth...I hope that helps:-) good luck! What size paper do you start out with? Super cute idea! Visual perception speak best when it does and you’re just up to the mark. You’re doing good work by sharing all your work and lesson with the people so they may learn same like you.